"A lot of ceramics I would like to sell before I leave town!" 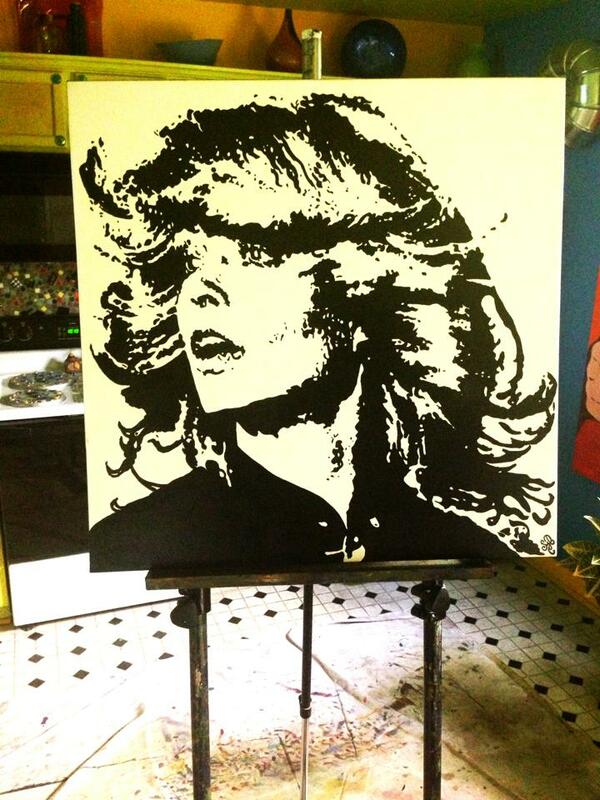 If you are interested in purchasing her work, email Alexandra at alexandraleighp@me.com. 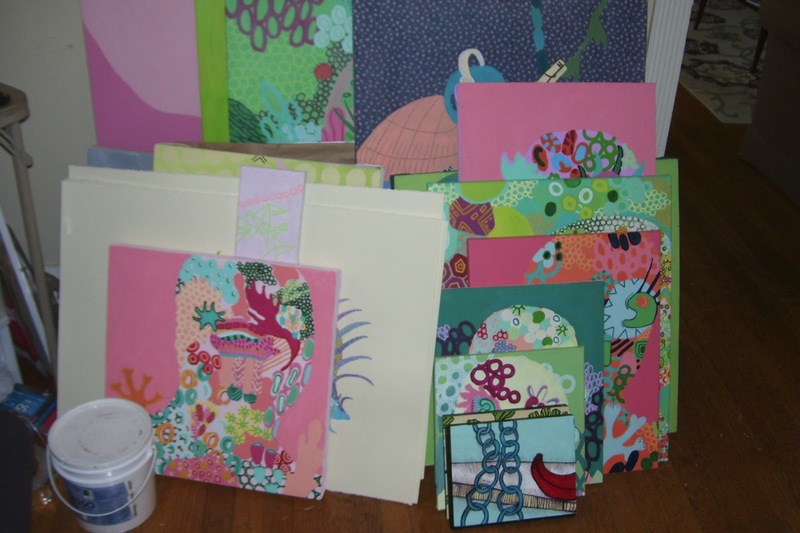 More of her work can be viewed on her website. Ali Cavanaugh, La Fee Verte, watercolor on panel, 30"x30"
Please join us throughout July for a group show featuring our gallery artists! Note: We will not be having an opening reception this month. From the studio of Derrick Dent. Material was founded by Hamlett Dobbins and Julie Meiman in late 2004. A 19' x 16' exhibition space set in the storefront on Broad Avenue in the Binghampton neighborhood of Memphis, Material takes its name from Montessori learning tools. The space was built to provide emerging and established artists with an intimate, clean space in which to share their work with Memphis' growing arts community. The programming consists of monthly or nightly shows as well as artists' lectures in connection with local colleges and universities. 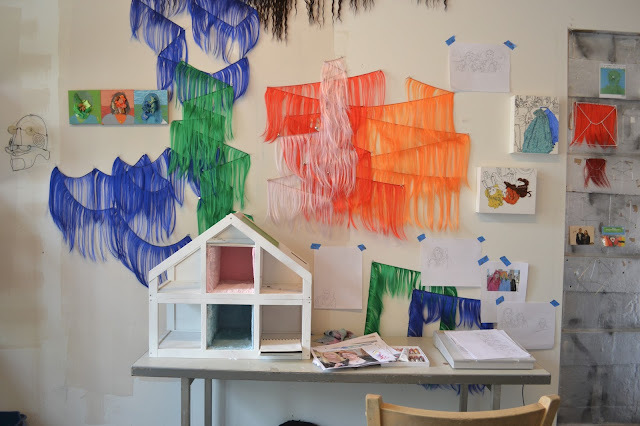 Material has served as a space for young artists to have their first shows, as well as a place for established local and regional artists to test new ideas in a public forum. 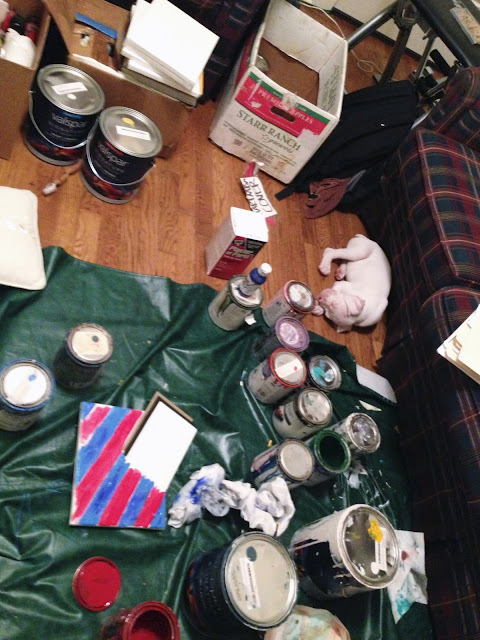 In addition to serving local artists, Material has hosted artists from Birmingham to Tokyo. This exhibition celebrates and commemorates Material Art Space's inspiring and longstanding impact on the Memphis art community and its unprecedented run as an alternative space. In May of 2013, Material celebrated its 100th exhibition and in August it will host its final show as Hamlett Dobbins leaves for an eleven-month stay at the American Academy in Rome. 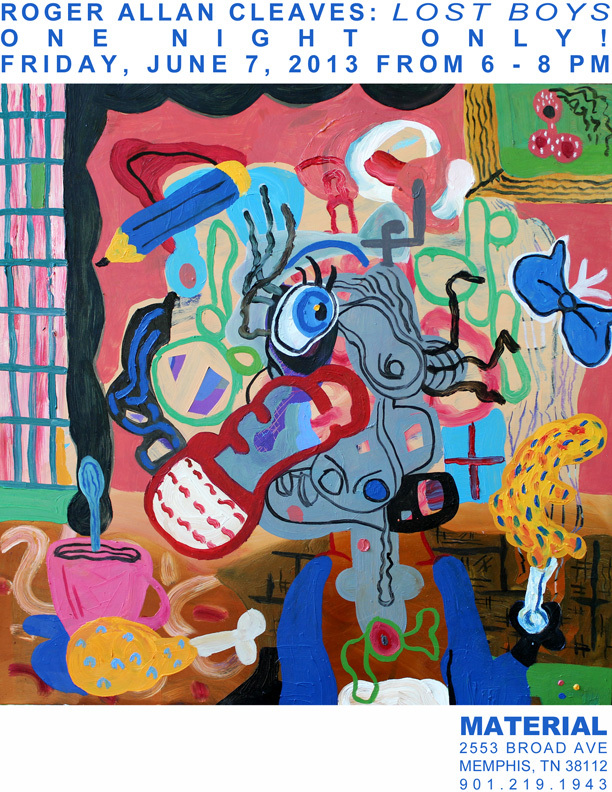 The exhibition at Crosstown Arts will feature work by over 50 artists who exhibited at Material from 2004 to 2013. 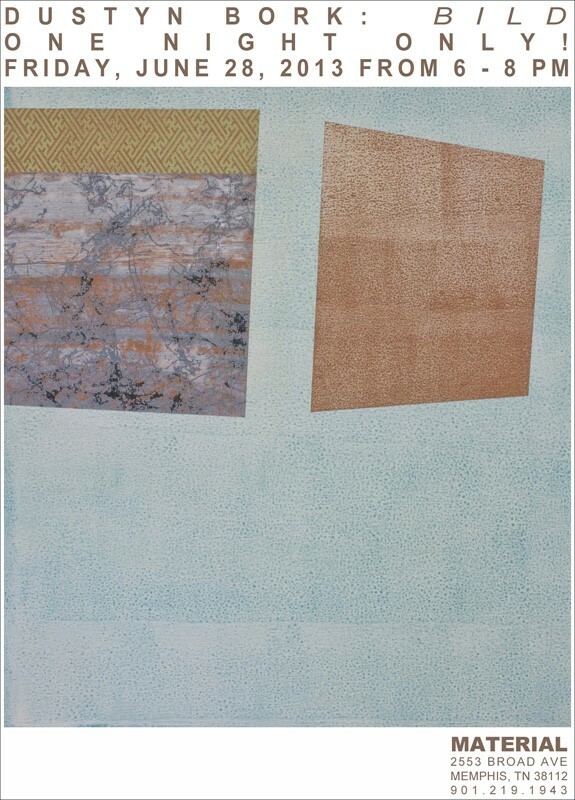 Among the many artists who will contribute to the exhibition are Greely Myatt, Mark Nowell, Melissa Dunn, Mel Spillman, Bobby Spillman, Rebecca Robert, Elizabeth Alley, Clayton Colvin, Kathleen Perniciaro, Douglas Degges, Dwayne Butcher, Tad Lauritzen Wright, Adam Farmer, Susan Maakestad, Jonathan Auger, James Inscho, Clare Torina, Jamie Harmon, Holly Cole, Pete Schulte, Georgia Creson, Alex Harrison, Jordan Martins, Maggie Kleinpeter, Jeana Baungardner, Joel Parsons, Mary Jo Karimnia and Joshua Huyser. Contact: Hamlett Dobbins dobbinsh@rhodes.edu or Emily Harris Halpern Emily@crosstownarts.org. 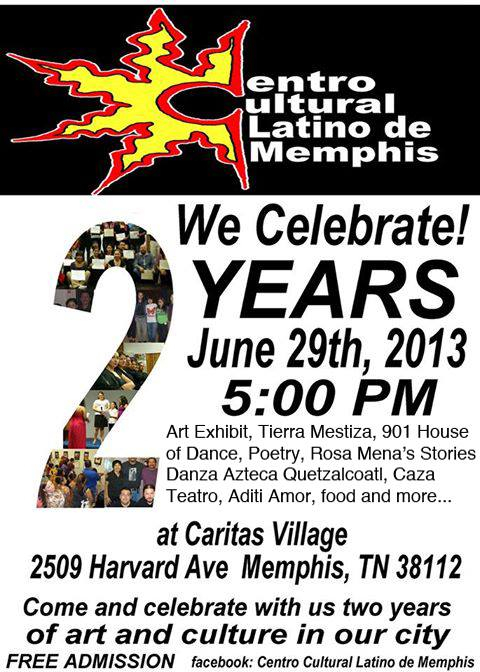 You are invited to the second anniversary celebration of the Centro Cultural Latino de Memphis (Latino Cultural Center of Memphis) on Saturday, June 29th from 5pm to 7pm at Caritas Village, 2509 Harvard Avenue in Binghampton. Two years after opening its doors to the community, the CCLM - represented by a steering committee composed of local residents active in the Latino arts and cultural community - couldn't be prouder of announcing this big milestone. "It has been a huge adventure for us," said Gaelle Llambi, a member of the steering committee. 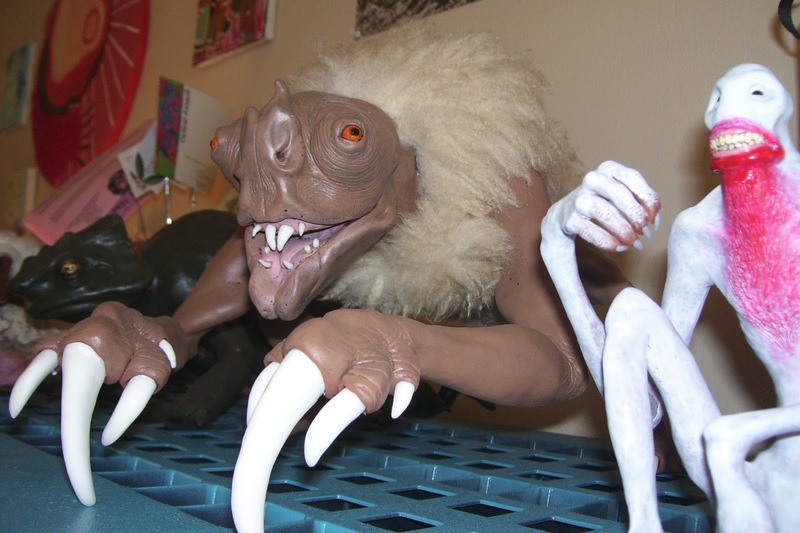 "This couldn't have been possible without the dedication, love and talent of our local artists who, weeks after weeks, are teaching, fomenting and creating new forms of cultural expression." The Centro opened its doors in June 2011 to strengthen the local Latino community through the development of artistic understanding and practice among both youth and adults. Workshops on Aztec Dancing, Drawing for Youth, Theatre and Literature are taught by accomplished practitioners of each creative discipline. At the end of each session, a showcase is organized to present the work of the students. 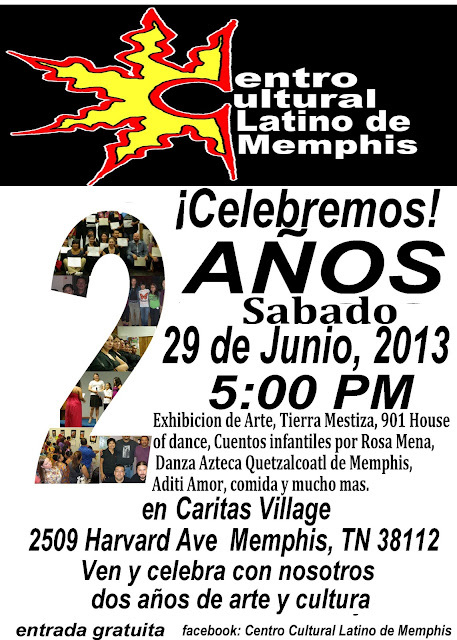 On the 29th of June the traditional dance troupe of Tierra Mestiza will perform, the hip-hop group 901 House of Dance, Poetry by Federico Gomez' students, Rosa Mena will tell children's stories, an art exhibit by Bianca Tudon's students, a presentation of Alebrijes, Danza Azteca Quetzalcoatl, Caza Teatro, and musical guest Aditi Amor. All showcases and our anniversary celebrations are free and open to the public, so bring your family, friends and neighbors because that's what it's all about at the Centro. For more information, email Gaelle Llambi at lagaelle.llambi@gmail.com. Dustyn Bork, No. 2 from the Bild series, acrylic on wood panel, 20"x18"
From the studio of Lea Holland. 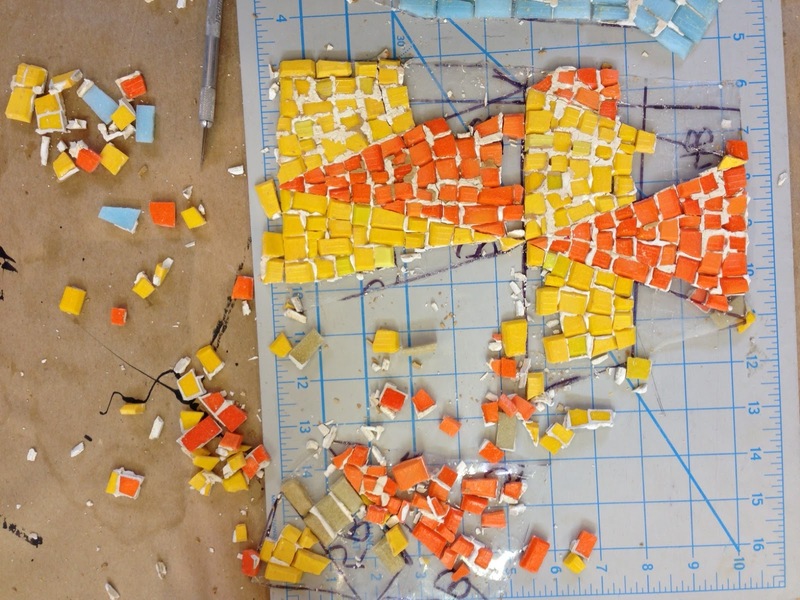 Mosaic restoration fail: 60 year old mosaic crumbles. Michel Allen, curator for Gallery 363, tapped Greely Myatt to organize a show and Myatt created a scheme for a curation pyramid. Simply put, Myatt invited three artists who were asked to - in turn - invite two artists each who would then invite one artist each. With no single curator, the organic route to curation brought together a diverse array of talent and styles including: Yvonne Bobo, Melissa Dunn, Greely Myatt, Michael Bogle, Andra Moore Eggleston, Joel Parsons, Jenn Brandt, William Eggleston, Jonathan Payne, Stephanie Cosby, Tylur French, Terri Phillips, Hamlett Dobbins, Fletcher Golden, Amanda Sparks and Matt Ducklo. 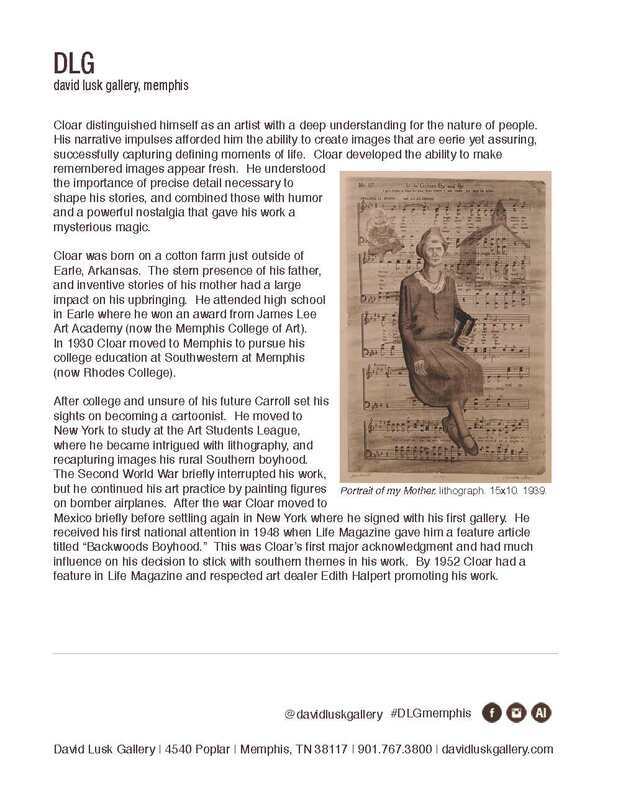 Said Myatt, "When asked to 'curate' an exhibition for Gallery 363, I thought of several things. Mainly, I thought I didn't want to curate an exhibition. I didn't want to accept the responsibility of what that meant. 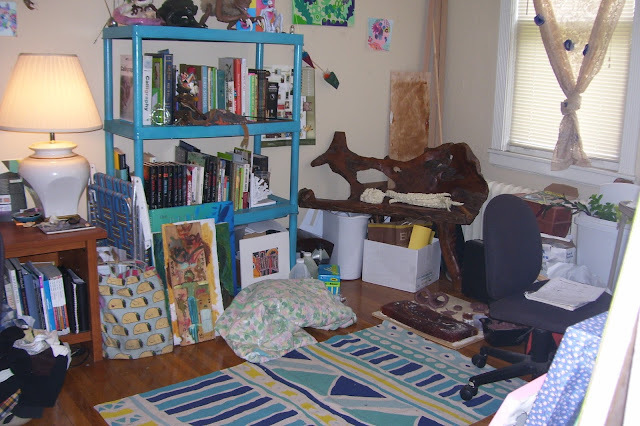 I also didn't want to limit it to my subjective choices, which would be inevitable in the act of curating or choosing. So, I devised a scheme, a pyramid scheme, which would coincidentally connect it to Memphis. 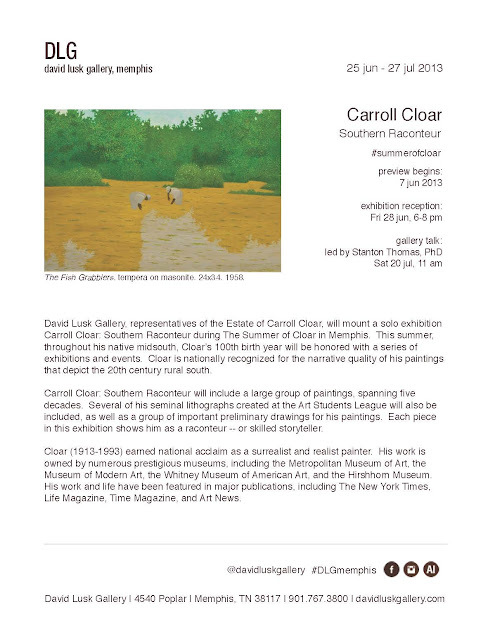 I decided to 'co-curate' an exhibition for Gallery 363. I would ask three artists to ask two artists to ask one artist. The individuals I asked are artists whom I have great respect for their work and for their integrity as artists. I was conscious of asking individuals who moved in somewhat different circles, as much as that is possible in a Southern city. I asked them to select with the same criteria in mind." Viewings of Myatt's Pyramid Scheme after the opening are by appointment 901 452 8033. 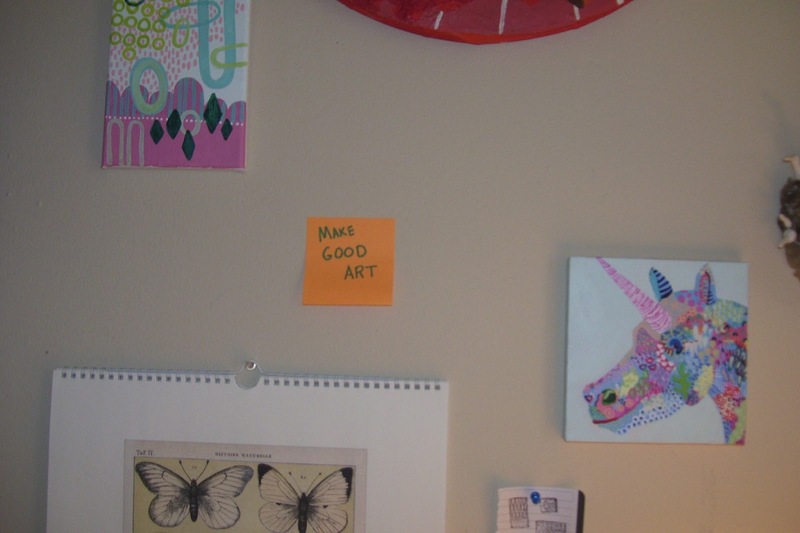 Leadership Memphis Gallery 363 is managed by Allen Hall Projects. This is my space at Rozelle Warehouse. There are some openings if anyone is looking - it's a terrific place. This image has some wire work, hair work, some 3D collage/mosaic face work and a piece I am working on while I contemplate a show I'd like to put together in the future about Suburbia. From the studio of Chuey Avila. Step one of a photosynthesis/iodine leaf printing process. CALLING ALL ARTISTS: Please send me images of what's in your studio right now. It can be taken with an 8x10 large format camera or an iPhone, I don't care. It can be work in process or finished. You don't have to be in Memphis...if you've had ties to Memphis in the past that's great, too. I'd like to do a "What's in your studio" series for Visual Memphis. Feel free to send just an image or include descriptive text/contact info so people can find you. Completely up to you. Email to ktmaish@gmail.com. 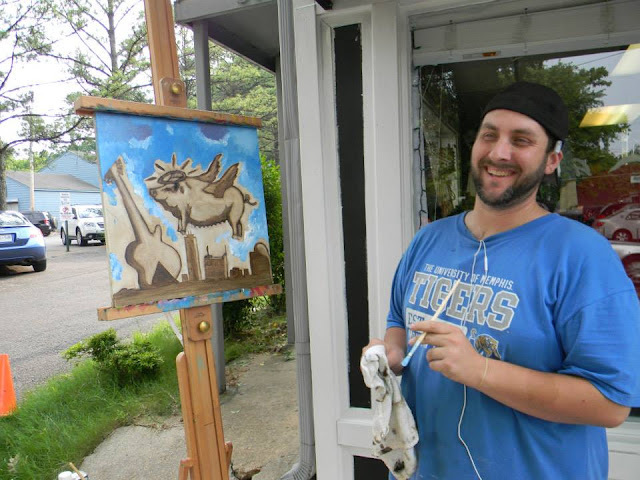 Join us for coffee, conversation and live artist demonstrations at Allie Cat Arts! 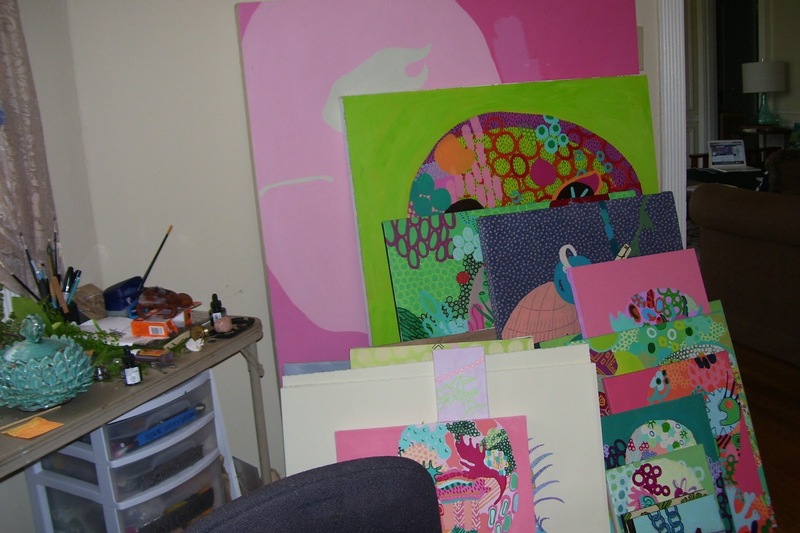 This week, local artist Chloe York will be painting LIVE at the gallery. This event is free and open to the public...all ages welcome. Stop by and see us! Memphis College of Art is proud to present Scope. 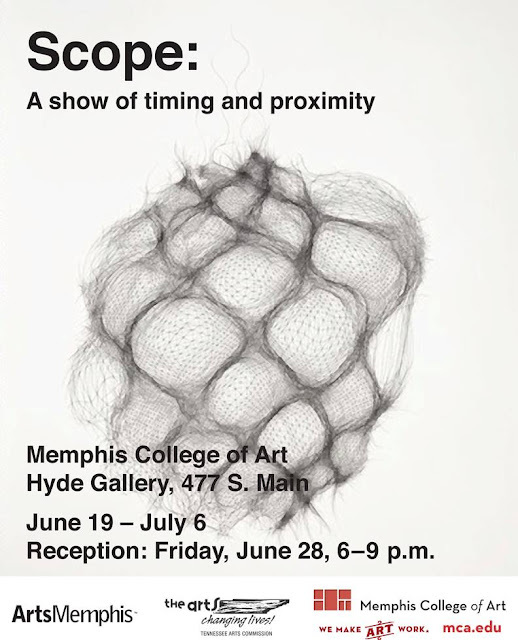 This exhibition was organized by Director of Graduate Studies, Haley Morris-Cafiero, and presents work created by students, faculty and alum of Memphis colleges. The participating artists work in diverse styles and materials including, but not limited to, photography, wood, ink, encaustic and rice. 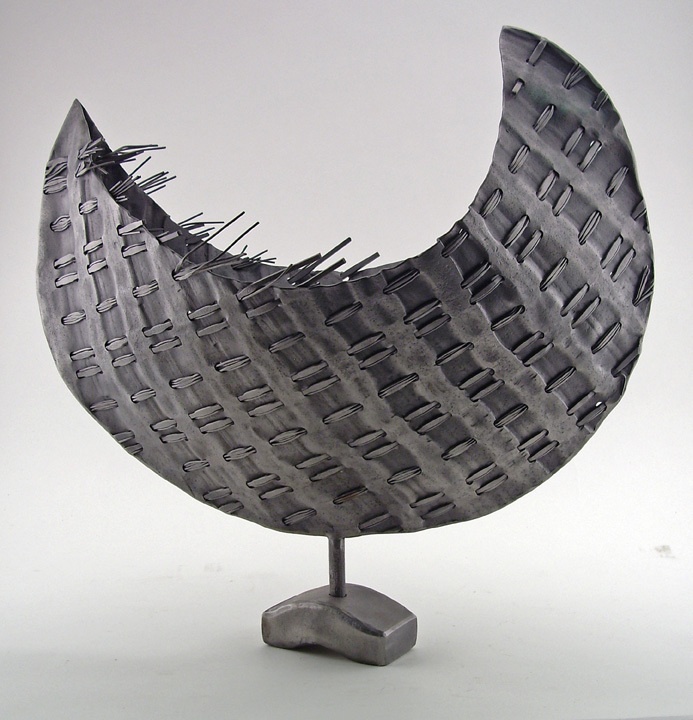 Former apprentices from our metal shop will show recent work alongside work from their time at the Metal Museum. It's a rare chance to see the direct connections between our metals shop and our galleries as we celebrate the history and influence of the apprenticeship program. For more details, visit the Metal Museum website. Featuring 30 local Memphis artists! RAW is an indie arts organization for artists, by artists. 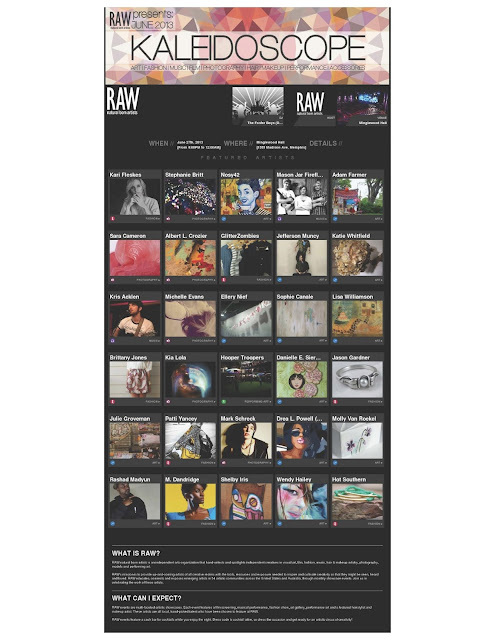 Every month RAW hand selects and showcases artists in film, fashion, music, art, performing art, hairstyling, makeup artistry and photography. RAW creates a one-night showcase event that features local creativity in all of its flavors. For information about the upcoming event, visit www. 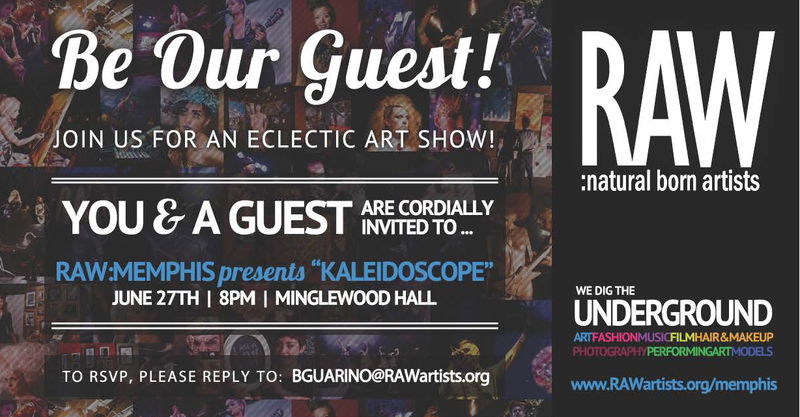 RAWartists.org/memphis/kaleidoscope. 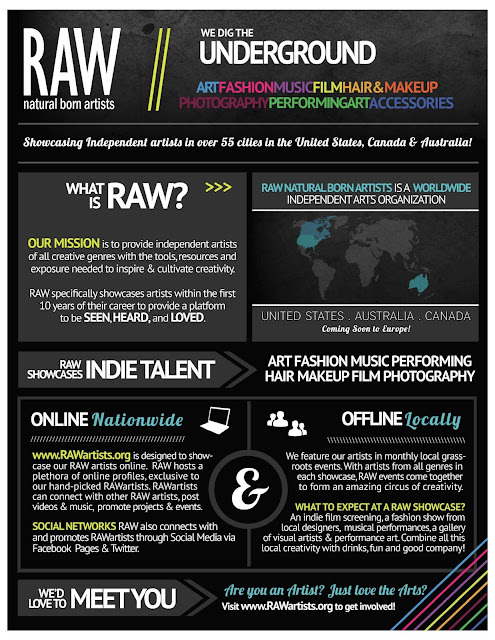 To find out more about RAW as a national arts organization, check out this video. 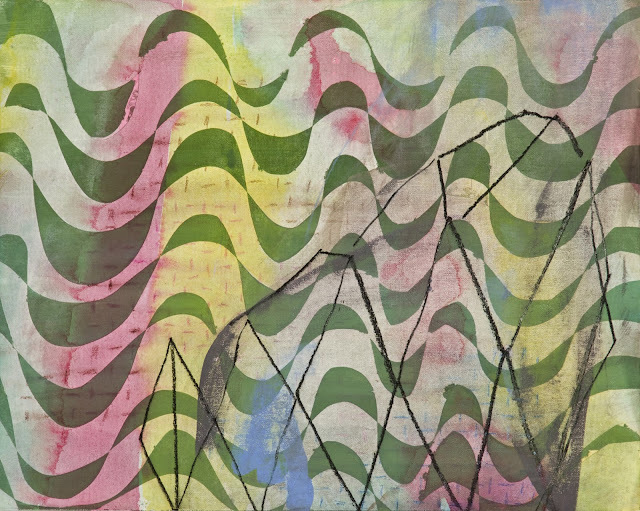 Material is excited to announce its one hundred-third exhibition, Adam Higgins: Cloud Castle. Cloud Castle will run for one night only on Friday, June 21st from 6-8pm. Adam Higgins lives and works in Memphis, Tennessee. 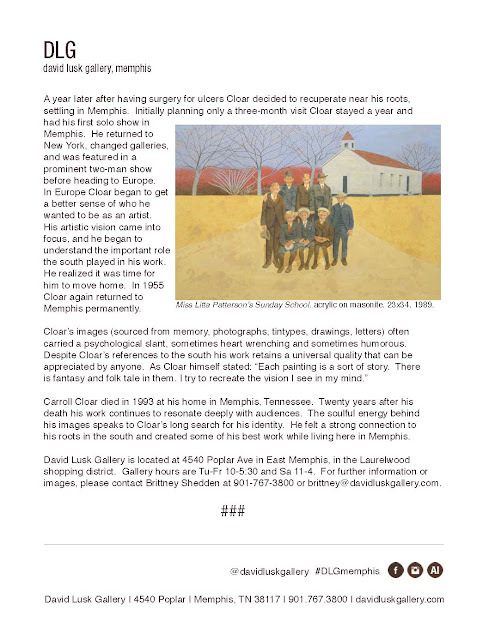 He earned his BFA in 2012 from Memphis College of Art. About the show the artist writes: "As a child, I often daydreamed about titanic gods building shelters in the clouds. I liked the idea of a celestial landscape parallel to my familiar one; of losing physical presence by projecting the mind into a space that hovers just above chaos. Remaining tied to the absurdity and usefulness of this narrative, my paintings deal with charging the mind to negate the burdens of physical form through metaphysical escapism, and the mental prisons that can result. I am interested in the moments of hum that occur when time becomes inelastic and matter becomes a vacuum. Consciousness becomes trapped in static nonsense." 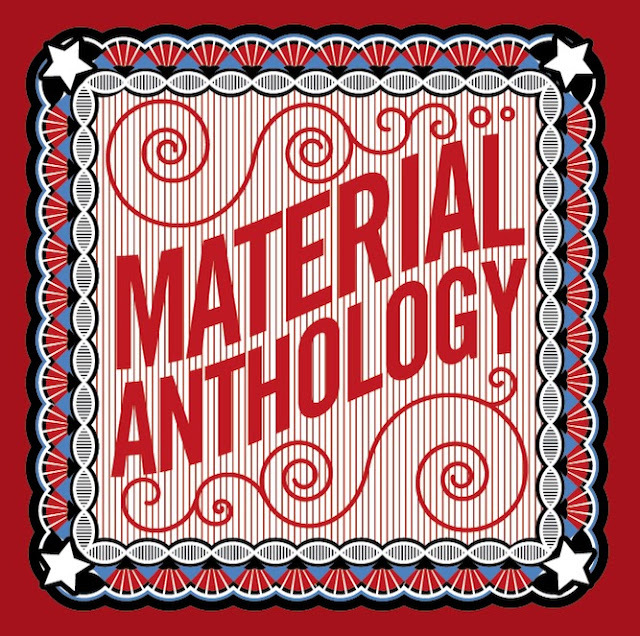 About Material: Founded by Hamlett Dobbins and Julie Meiman in 2004, Material is a 19'x16' exhibition space set in the storefront on Broad Avenue in the Binghampton neighborhood of Memphis. Taking the name from Montessori learning tools, Material was built to provide emerging and established artists with an intimate, clean space in which to share their work with Memphis' growing arts community. The programming consists of monthly shows as well as artists' lectures in connection with local colleges and universities. Material has served as a space for young artists to have their first shows as well as a place for established local and regional artists to test new ideas in a public forum. 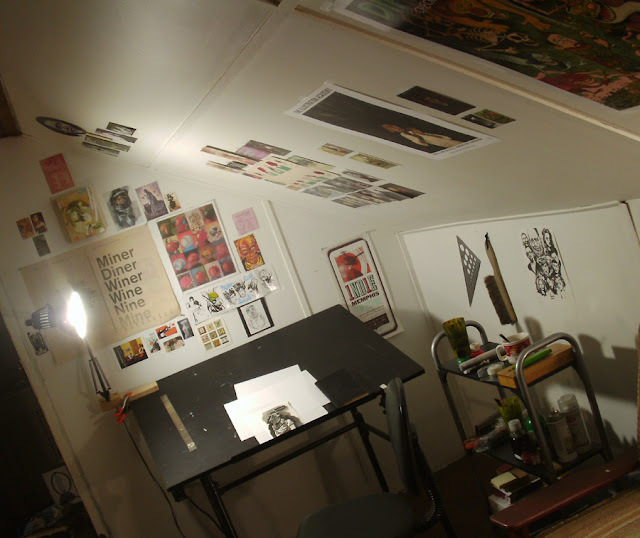 In addition to serving local artists, Material has hosted artists from Birmingham to Tokyo. Come visit. 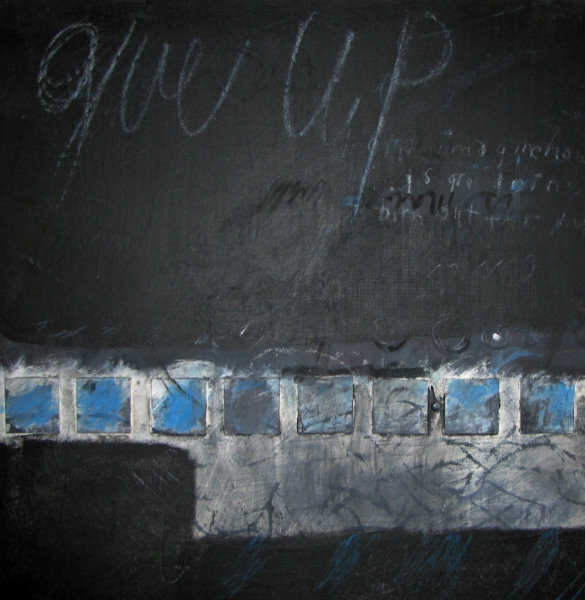 Artists from the metropolitan area of Memphis, Tennessee, have joined together to form an organization called BluesWax to foster and promote visual art incorporating encaustic painting. BluesWax's mission is to give visual artists an opportunity to exchange ideas, participate in group exhibits and benefit from monthly education programs. BluesWax aims to provide an interactive community for both established and emerging artists and art patrons with an emphasis on education, group creative sessions and peer critiques. BluesWax meets monthly on the second Sunday of every month. Workshops led by both nationally recognized as well as local artists involving encaustic painting will be held periodically. 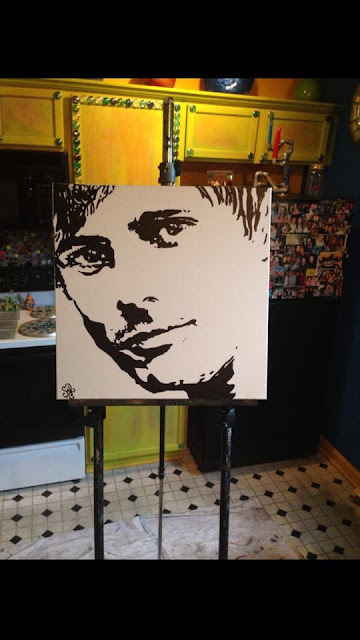 The focus will be on painting with various techniques that include encaustic and other media. Currently, our group includes artists utilizing oil, watercolor, acrylic, collage, photography, and cold wax; all have a common interest in incorporating encaustic in their works. 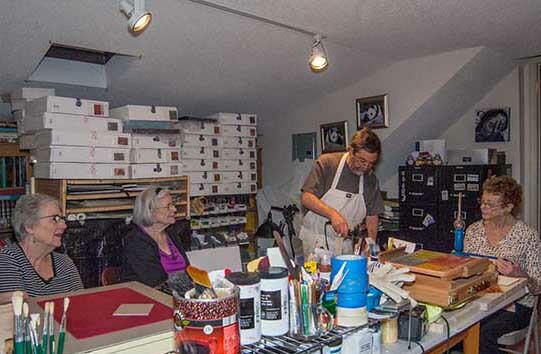 Several of our members regularly attend national and international encaustic meetings and bring the cumulative expertise of those sessions to our group. We have scheduled an encaustic workshop with Lisa Pressman, a nationally recognized artist and teacher, to be held September 28 and 29, for beginner and intermediate level painters. The public is welcome to register. BluesWax will involve community activities and specialized sessions that will be open to the public as well as activities for its members. In the last year our membership has doubled. Charter members include Judith Barrie, Virginia Schoenster, Norman Soskel, Veronica Tronolone and Mary K. VanGieson. 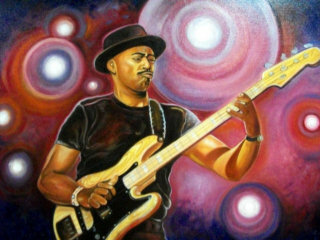 For information regarding our group and workshops, please contact Norman Soskel at 901 230 8083 or info@blueswax.org. See also www.blueswax.org for a brochure. Please join us at Nu this Friday night for MUCHO-lito, a printmaking show featuring work by a group of very talented young printmakers from Memphis College of Art. According to the project's website, War Baby/Love Child: Mixed Race Asian American Art "investigates constructions of mixed heritage Asian American identity in the United States. As an increasingly ethnically ambiguous Asian American generation is coming of age, this multi-platform project (book, traveling art exhibition, website and blog) examines how, or even if, mixed heritage Asian Americans address hybrid identities in their artwork, as well as how perspectives from critical mixed race studies illuminate intersections of racialization, war and imperialism, gender and sexuality, and citizenship and nationality." 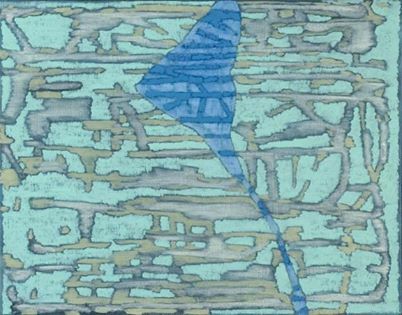 The exhibition features work across diverse mediums by 19 emerging, mid-career and established artists who reflect a breadth of mixed heritage ethno-racial and geographic diversity: Mequitta Ahuja, Albert Chong, Serene Ford, Kip Fulbeck, Stuart Gaffney, Louie Gong, Jane Jim Kaisen, Lori Kay, Li-lan, Richard Lou, Samia Mirza, Chris Naka, Laural Nakadate, Gina Osterloh, Adrienne Pao, Cristina Lei Rodriguez, Amanda Ross-Ho, Jenifer Wofford and Debra Yepa-Pappan. The exhibition is on display right now through June at the DePaul University Art Museum in Chicago. It will travel to the Wing Luke Museum of the Asian Pacific American Experience in August and will remain there through January 19, 2014. If your travels don't take you to either of these places, you may purchase the book on Amazon that includes a series of critical essays, interviews and images of artwork associated with the exhibition. For updates on upcoming events, see the War Baby/Love Child Facebook page. Richard Lou, Art Department chair at the University of Memphis, is kind enough to share some of his knowledge of and experiences with War Baby/Love Child here. VM: How did you get involved with the War Baby/Love Child project? RL: I got involved through Margo Menchida, a professor at the University of Connecticut and the preeminent scholar of Asian American contemporary art in the United States. I met her in the mid 1990s; she came to see my work in a show at the Museum of Photographic Arts in San Diego. She's been writing about my work on and off since then. When Laura Kina and Wei Ming Dariotis put War Baby/Love Child together, Margo recommended that I should be in the show as well. Laura Kina contacted me, I sent her my work, and that was it. VM: Tell us a little about War Baby/Love Child and the two women that organized it, Laura Kina and Wei Ming Dariotis. RL: Laura Kina is phenomenal. She's like a machine in regards to making art as well as organizing projects like War Baby/Love Child. Laura is an associate professor at DePaul University in Chicago. Wei Ming is at San Francisco State and she teaches Asian American Studies. They wrote several grants to put the show together at DePaul's brand new art museum and for the book published by the University of Washington Press. They also made a short video documentary in which some of the artists are interviewed. VM: Tell us about the essay you wrote for the book. RL: The essay was an opportunity for me to write about my work in a more theoretical and historical way. 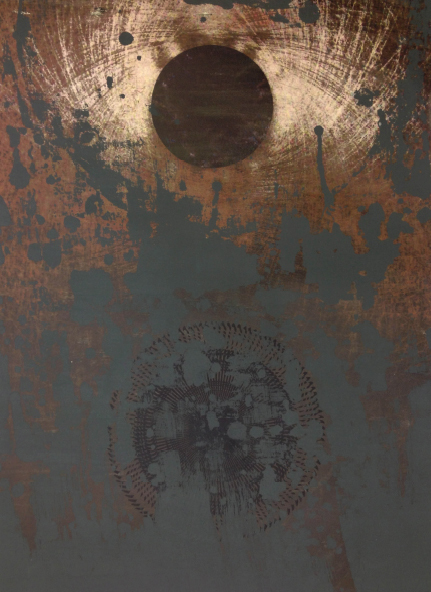 It gave me the opportunity to rethink and recontextualize an older piece that I discuss in the book called Border Door. For me to be able to think about Border Door twenty five years later was a real gift. I was also able to write about Los Anthropolocos, a body of work that me and my collaborator, Robert Sanchez, had not previously written about. 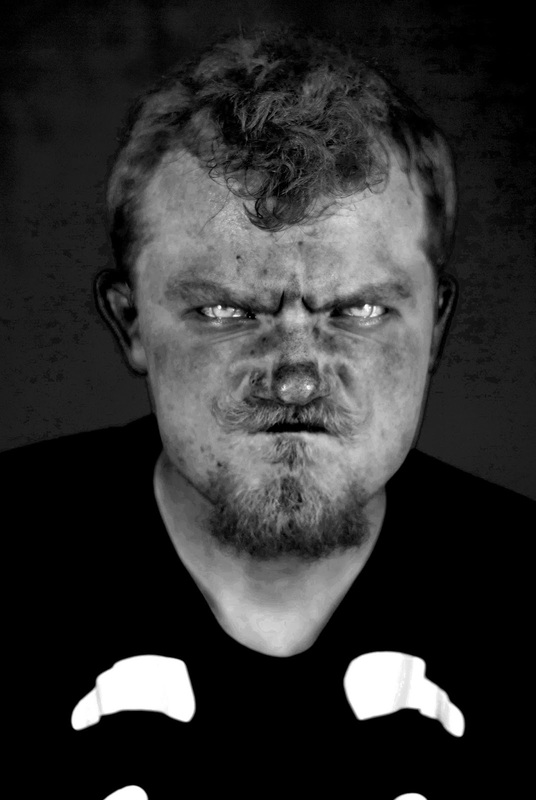 We've written content for Los Anthropolocos: artist statements, narratives, and screenplays for videos we've produced. This was the first opportunity to create a reflective analysis of how Los Anthropolocos came about and the significant strategies at play in terms of the use of performance as a way of decolonizing the body. Through text, I was able to concretize the theorizing that occurred in the air between Robert Sanchez and myself regarding Los Anthropolocos. It also gave me an opportunity to give credit where credit is due in terms of thanking and acknowledging people for their contributions to my formation as an activist and artist. This includes the Centro Cultural de la Raza in San Diego and, of course, the people associated with the Centro and many other centros in the Southwest. I wrote about individual artists, theoreticians and writers. Coco Fusco's ideas and her writing influenced my worldview, thus how I create work and strategize about different approaches to working. VM: What work is included in the War Baby/Love Child exhibition? RL: The show gave me an opportunity to create and think about new work, Stories on My Back, which is a body of work that continues to be developed. 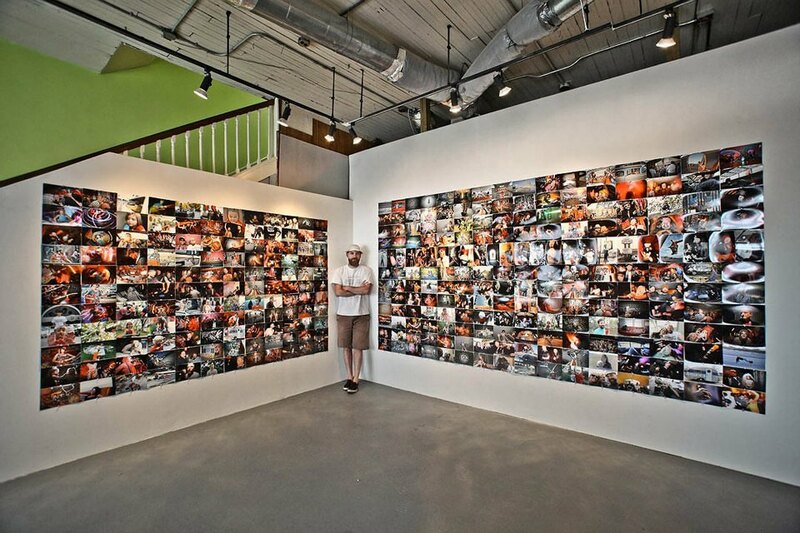 Although the work included in War Baby/Love Child is a snapshot of the larger exhibition I did at the Power House in Memphis a few years ago, it has evolved into a much larger, more complicated installation over time. While there was one story that was played in the Power House, there are now six stories. Instead of elements on the wall and ceiling, it is now a freestanding architectural piece through which the viewer navigates. As you walk through the installation, you hear parts of the stories being told. It also includes video projection. It has become much more complex, and I think that only happens when you work on your work, but also when there are opportunities afforded you. I've been very lucky that people invite me to have exhibitions. It's an opportunity where I can go into a space and really challenge myself, the space and the audience in regards to how they will position themselves to the physicality, narratives and world view of my work. War Baby/Love Child is an opportunity to articulate all these stories that I have and to figure out ways the audience can engage with them in the most dynamic way possible. VM: What about the other artists participating in the exhibition? RL: Some of the artists are the same ones I've been talking about for years to my students: Albert Chong is one of my all-time favorite artists and I'm delighted to be in the show with him. I'm a long-time admirer of Kip Fulbeck and Louie Gong. The really cool thing about War Baby/Love Child is that I've also been introduced to a lot of young artists: Gina Osterloh is a photographer who does really interesting work. As an artist, whenever there's a national show put together, it's a really wonderful opportunity to find out about other artists that are working in the same field with the same concerns that articulate these issues in their own way, based on their own experiences and ideological framework. It's really exciting to see what they're doing. VM: How do you think War Baby/Love Child contributes to a national/international dialogue about Asian American art and culture? RL: War Baby/Love Child is - dare I say it - an important landmark show. It's not just about Asian Americans (which is important unto itself). It's also about redefining the Asian American experience within the confines of the United States as a group of people based on ethnicity and how that ethnicity is articulated and rearticulated moment by moment. We are in the process of reinventing and redefining who we are vis-a-vis the strong traditional narratives of being Chinese in contrast with being Chinese American in contrast with being Chinese American Mexican (in my case). Albert Chong: Chinese African American. Kip Fulbeck: Chinese and White. Laura Kina: Filipino, Hawaiian, German and Jewish. It really talks about breaking the stereotype of these closed Asian societies and seeing them as these monoliths but viewing them through the model of the diaspora. How has this monolith been dismantled by intermarriage? Especially in regards to the United States, how has the legality of marriage to Asians and other ethnic groups been managed by specific racial and immigration laws in the United States? What about Japanese internment camps and foreign policy in the United States as an imperial power? There is also the settlement of Asian Americans as an intellectual and cultural labor force. All of this is coming into play in this exhibition. I must also emphasize the interdisciplinary nature of the work. In academia, I think interdisciplinary work is work of survival. We can't examine our world using one discipline at a time; it's just impossible. All artists involved in War Baby/Love Child are interdisciplinary: it's not just about aesthetics but also history and all sorts of things. I think when we start looking at our world and the relationships we have with each other in a more holistic way, we're much better off. War Baby/Love Child is a very rich exhibition where these artists are, in a sense, singing in unison their own story. It's a wonderful thing to be a part of. Calling all artists! 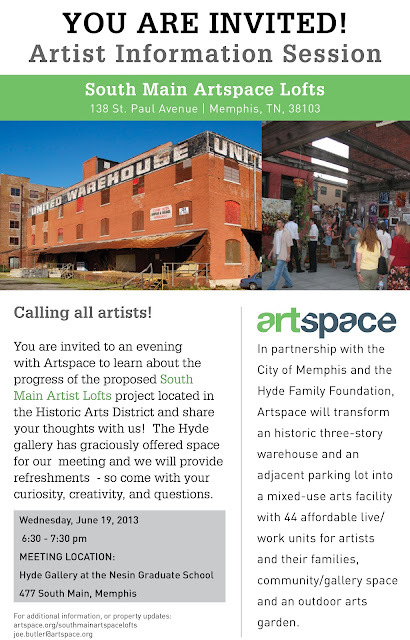 You are invited to an evening with Artspace to learn about the progress of the proposed South Main Artist Lofts project located in the Historic Arts District and share your thoughts with us! The Hyde Gallery has graciously offered space for our meeting and we will provide refreshments - so come with your curiosity, creativity and questions. About Artspace: In partnership with the City of Memphis and the Hyde Family Foundation, Artspace will transform an historic three-story warehouse and an adjacent parking lot into a mixed-use arts facility with 44 affordable live/work unites for artists and their families, community/gallery space and an outdoor arts garden. There is so much great art energy lately in Memphis with giant shows like Present Tense and Memphis Social, burgeoning arts districts like Broad Avenue and the up-and-coming Crosstown Arts and new galleries popping up everywhere - from commercial spaces to living rooms. There is also some great grassroots inclusiveness with shows like The Epic Unicorn Show and Hanging Participles. In an effort to keep this great art energy flowing in Memphis, Mary Jo Karimnia is hosting Unchained: A Memphis Art Chain Letter Exhibition at The Rozelle Warehouse on Friday, June 14, 6-8pm. 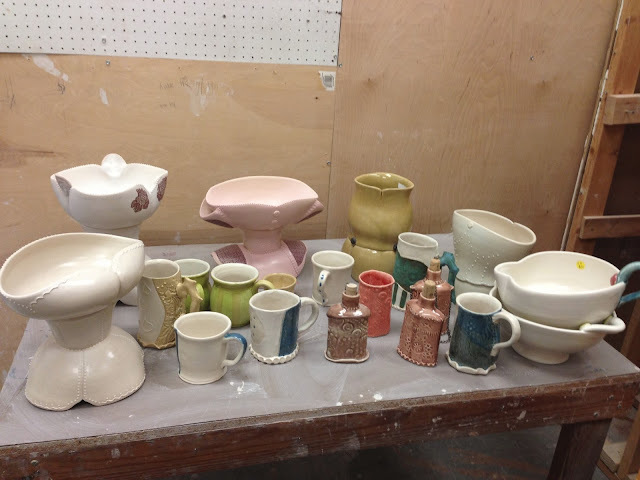 Artist demonstrations and open studios Saturday, June 15, 12 - 5pm. Stitching the Water to the Shore, 2012, acrylic and charcoal on canvas, 16"x20"
Material is excited to announce its one hundred-second exhibition, Clayton Colvin: All Magic is Dangerous. All Magic is Dangerous will run for one night only on Friday, June 14th from 6-8pm. 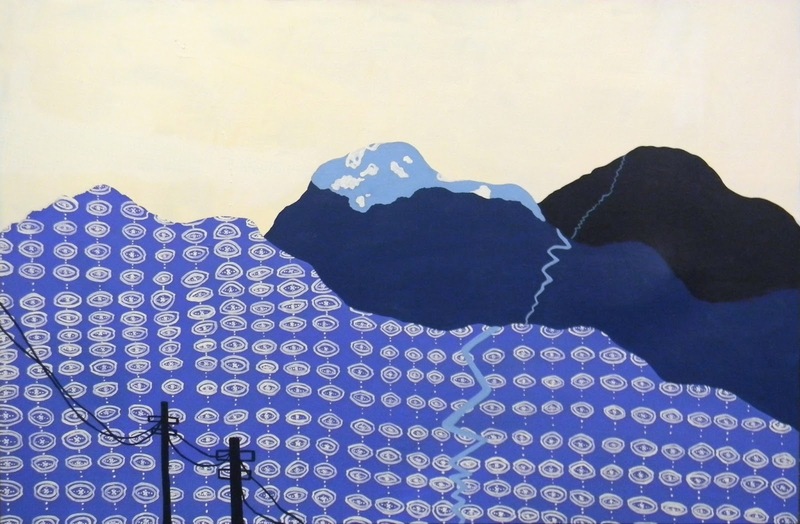 Clayton Colvin has developed a practice of painting that is both challenging and seductive. 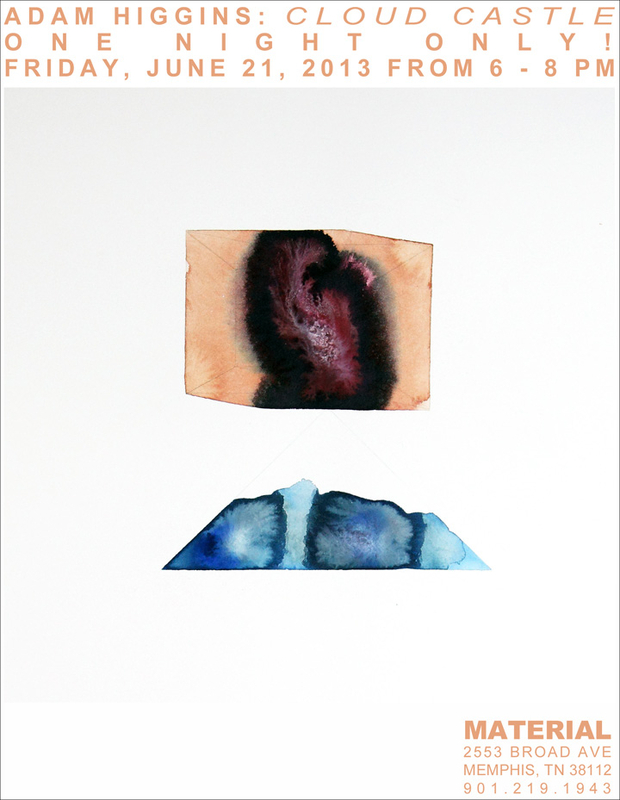 He uses a hybrid of figurative and abstract approaches to create delicate, fantastic and concrete spaces. The immediate and intimate nature of drawing infuses his linen panels with a hypnotic mix of familiarity and mystery. The resulting images are skillfully constructed poems, or Burroughs cut-ups, in which the viewer gets pleasantly lost in language. Clayton Colvin received his MFA in painting from the University of Alabama. 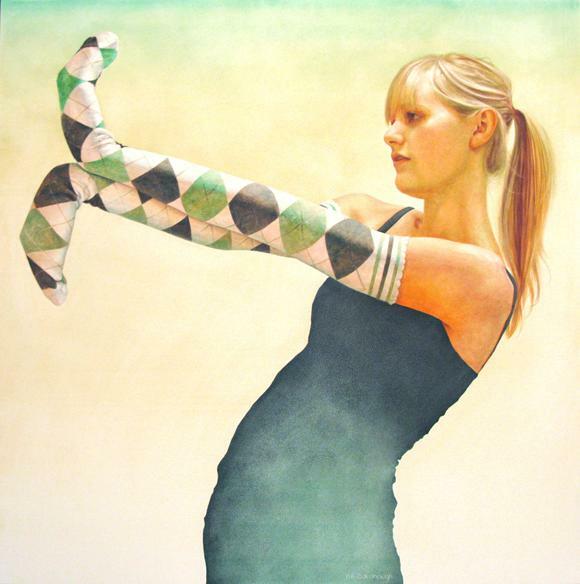 He received an undergraduate degree in Art History from NYU in 1999 and holds a Masters in Art Education from UAB. His work has been exhibited most recently in 'Birmingham's Best Young Artists' at Schedler Minchin Fine Art in Homewood. Additional information can be found at the artist's website. This is his fourth exhibition at Material. More to come soon regarding the Unchained exhibition happening at Rozelle Warehouse, June 14th. Meanwhile, here's the chain letter that started it all. What an exciting experiment in social engagement! This is an ART CHAIN LETTER - my own little way of keeping all this fabulous art energy going on in our great city. This is an invitation from me to you to participate in Unchained, a one-night-only show at (your locale) on (your date and time). 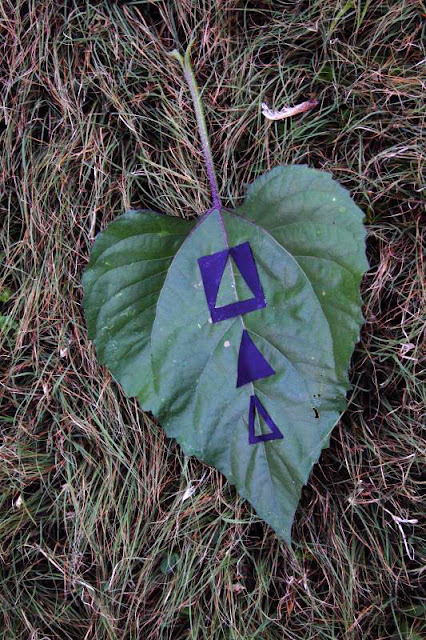 The main purpose of this exhibition is to Spread the Love. 2. Add your name and contact info to the list below (name, email, phone #). 3. Within 24 hours forward this chain letter to another artist, someone whose work you are curious about but someone with whom you have never had coffee. 4. If you are artist number (you decide), we have reached our limit. Please do not forward the chain letter to another artist, instead send it back to (you) to complete the chain. If you cannot or do not wish to participate please speak up right away so that we can back up and complete the chain. 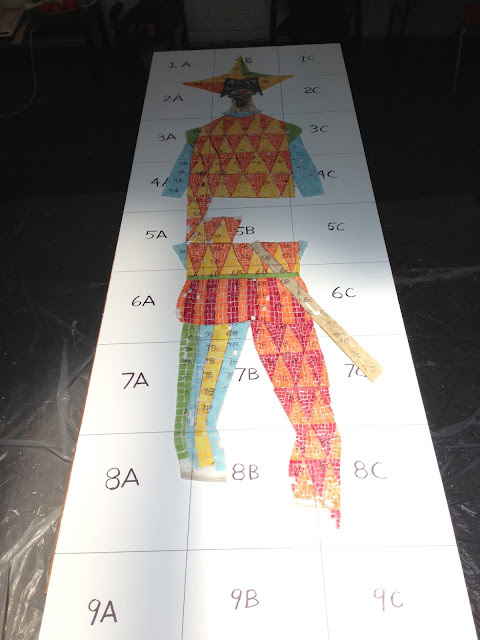 After the chain is complete (you) will send out details about when to install your work. And your final step in the pre-show process, as part of the social aspect of this exhibition - go ahead and schedule that coffee with the artist that you invite. Join us for coffee, conversation and live art demonstrations during out first Sunday Social event! Local artist Andrew Groves will be painting LIVE at the gallery. And Windsong Levitch, our "store psychic" (and very talented author, artist and storyteller) will be doing free card readings. This event is free and open to the public...all ages welcome. Hope to see you there! To RSVP, visit our Facebook event page. Parking is available across the street at Lee Pruitt and at Market Central, one-half block west of the gallery. Crosstown Arts partnered with the Vollintine/Evergreen Community Association in May for their annual Memfeast series. FEAST (Funding Emerging Artists with Sustainable Tactics) is an annual public dinner designed to use community-driven financial support to democratically fund emerging art makers. Memfeast is Memphis' local version founded and facilitated by Crosstown Arts, helping to rethink how the arts are financed and experienced communally. Several local artists presented proposals to an audience on May 18th for a public art project to be located on the V&E Greenline. Votes were tallied that evening and Jeannie Tomlinson Saltmarsh was announced the Memfeast IV winner with her project, Are There Fish in Lick Creek? VM: First of all, congratulations! Now, tell us a little bit about yourself and your work. JTS: I grew up in Memphis. My father is an architect. Our house was always under construction. We bought a small, brick house in East Memphis, built a wood house over the brick then knocked down the brick house while we lived in it. I believe I have inherited the desire and drive to design and build from my father. I have a Bachelor's degree from the University of Memphis and attended the Southwest Community College welding program as well as the Penland School of Crafts to study with Elizabeth Brim. Among many things, she taught me the inflation technique I am using for the Crosstown Arts/V&E project. I have been involved with the Metal Museum for over 20 years in many capacities: a volunteer, artist in residence, gift store product development and small commissions. I currently work in the foundry casting aluminum, bronze and iron into sand molds. 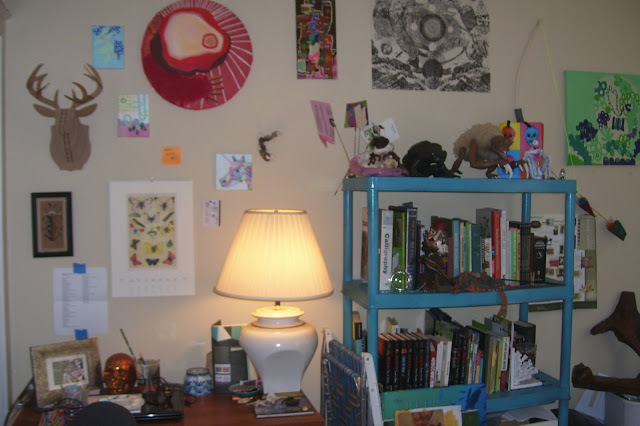 Regarding my art work, I have traditionally gravitated toward functional decorative arts. 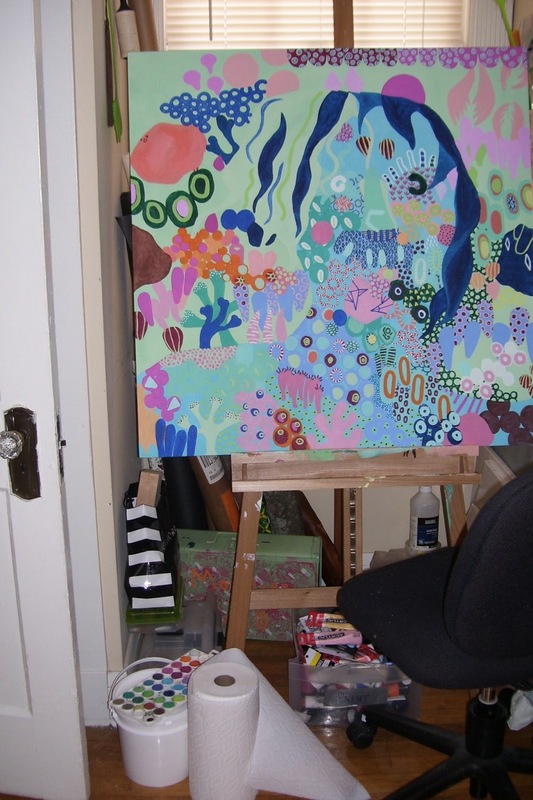 I grew up changing my environment to be a functioning work of art that reflected our family's personal experiences. 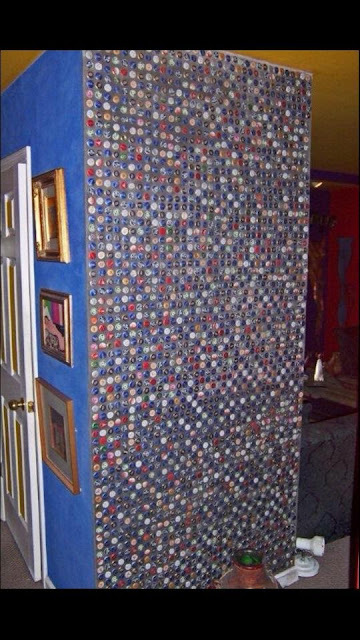 Today, my own home is full of functional pieces: light switch plates cast in aluminum or bronze, door stops and boxes cast in iron made from recycled radiators from old houses, drawer pulls and towel bars. Lately, it has been a bit of a leap for me to make something that doesn't have function. 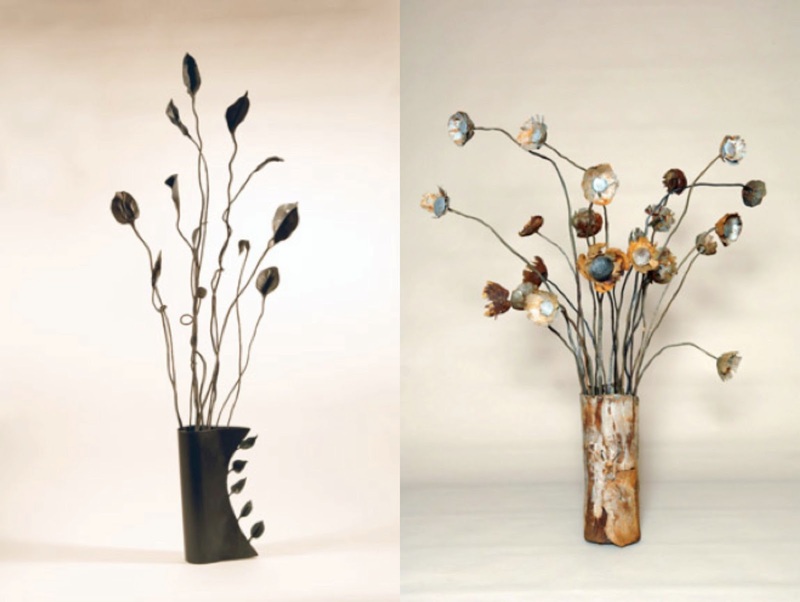 I've been working on a series of vases with flowers, petals and leaves: Always Alive is made of steel and Wrought Iron Vase and Flowers is made from reclaimed wrought iron from the First United Methodist Church in downtown Memphis. It was built in 1893 and burned down in 2006. VM: What's your relationship with the V&E community? JTS: I have lived in the neighborhood since 2003. 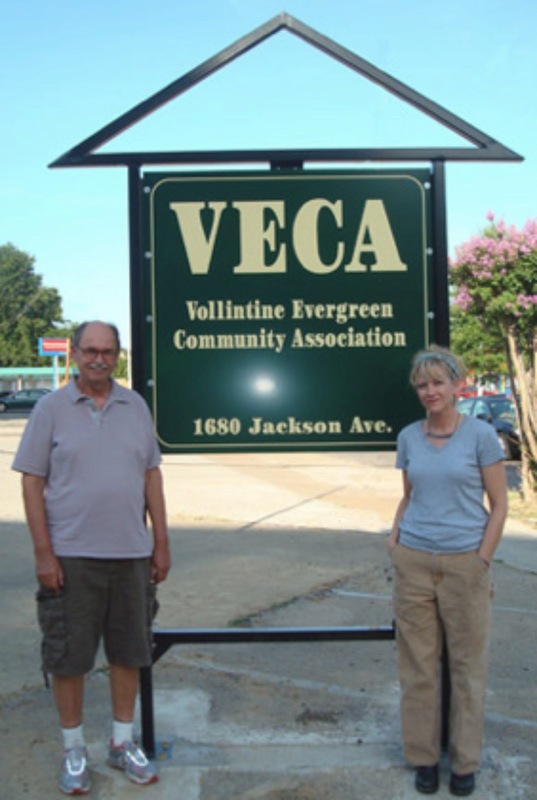 I contribute time, funds and skills to the community by designing and building the sign for the VECA community office on Jackson and serving on the neighborhood association board and committees. I am also a V&E Greenline user and contributor: I am currently repairing and repainting the Blue Kids sculptures located on the Greenline. VM: Tell us about your project, Are There Fish in Lick Creek? JTS: As a V&E Greenline user, I've often crossed the Lick Creek Bridge without much thought about the creek below. When Crosstown Arts put out the "call to artists" for this project, I took a walk specifically to look at the V&E Greenline. While on that bridge, looking into the springtime creek with all its fresh growth and moss, I wondered, "Are there fish in that creek?" I emailed Mary Wilder (the chair of the Lick Creek and Cypress Creek Committee for the V&E Community Association) and she replied that, yes, it has naturalized. It supports frogs, turtles, raccoons, ducks fish and more! Our creek serves as a biofilter for the storm water run off from our streets. It filters the water from our streets before it gets to the Wolf River, Mississippi River and finally the ocean. The V&E Greenline is a place of motion. 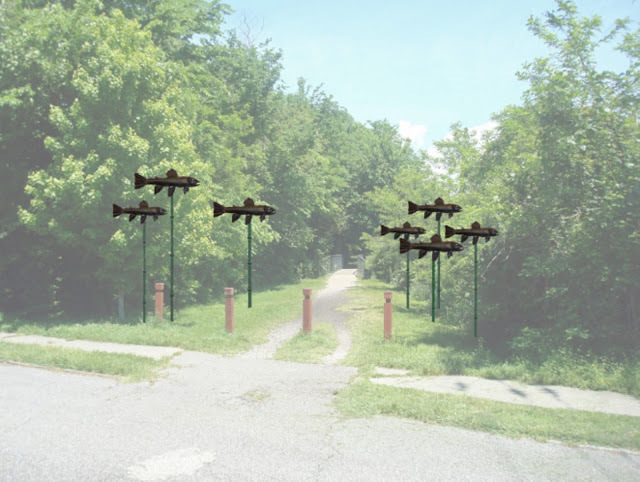 As such, I am making a kinetic school of fish at an entry point into the Greenline. 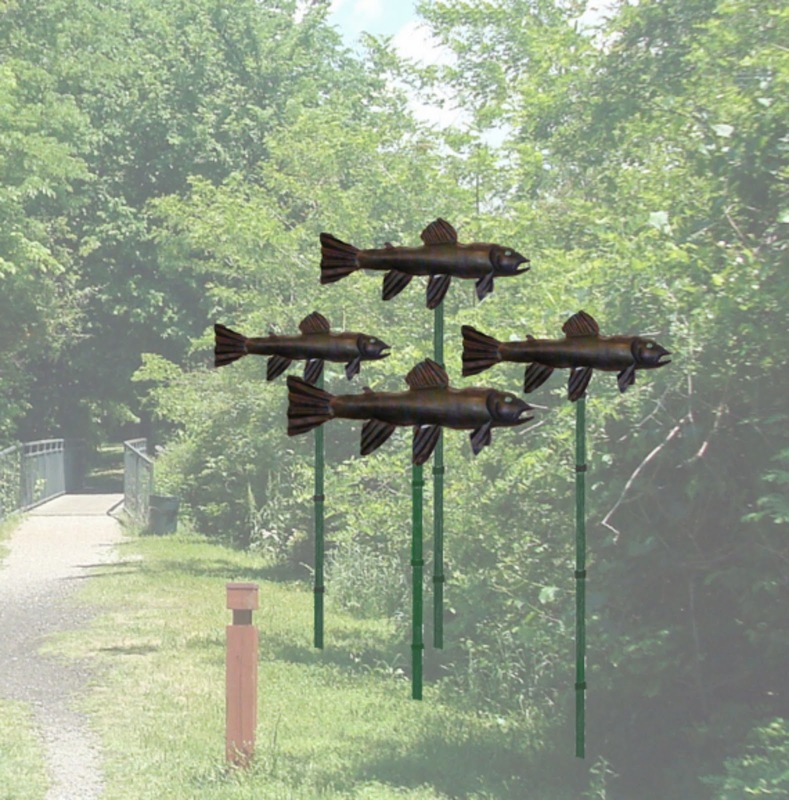 The fish, each about 3 feet long, will be mounted onto 12-15 foot poles with weather vane mechanisms allowing them to move with the wind. As the wind hits them all at the same time, they simultaneously change direction just like a school of fish. They will be made of 14-gauge steel. 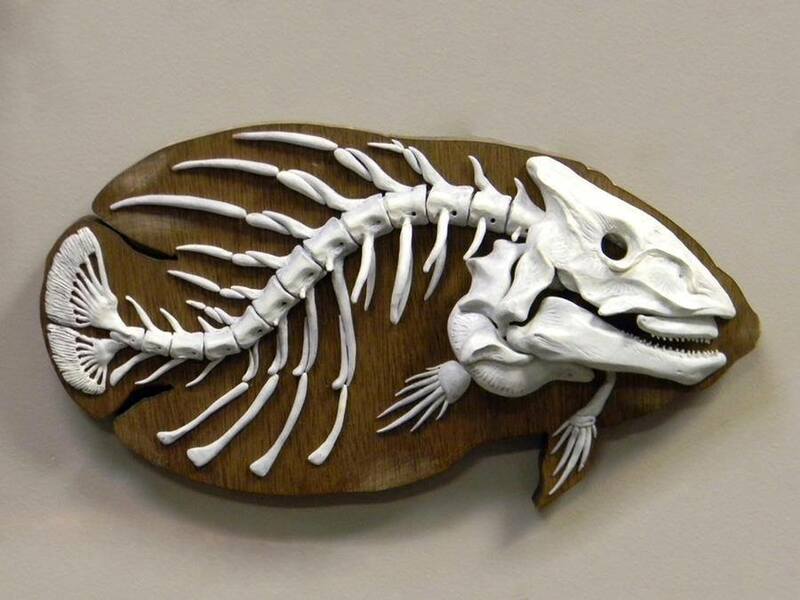 I will use heat and a press and/or a hammer and anvil to add texture to the various pieces that make up the fish body, fins and tail. 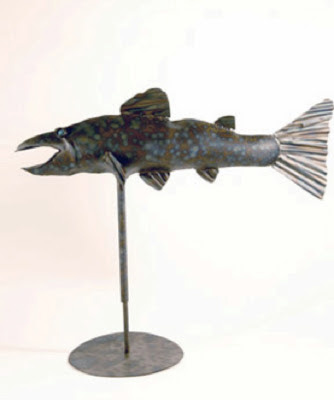 The two sides of the fish body, fins and tail will be welded together; a pipe is welded into the body for support. Each fish is heated in a gas forge. Compressed air is forced onto the body of the fish blowing it up/puffing it out and giving it a third dimension. The poles will be painted to look like water reeds or bamboo. I hope the sculptures will inspire people who pass them to think of the creek and maybe even slow down enough to look at the nature we are so fortunate to have in our neighborhood. VM: Where and when can we see it?!? JTS: This map shows a portion of the VECA Neighborhood. 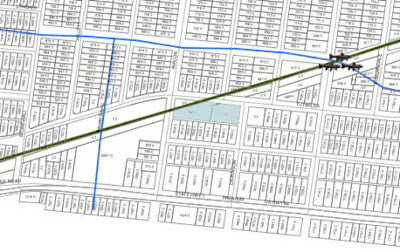 The green line represents the V&E Greenline and the blue lines indicate creeks. Lick Creek is the blue line running horizontally on the map. 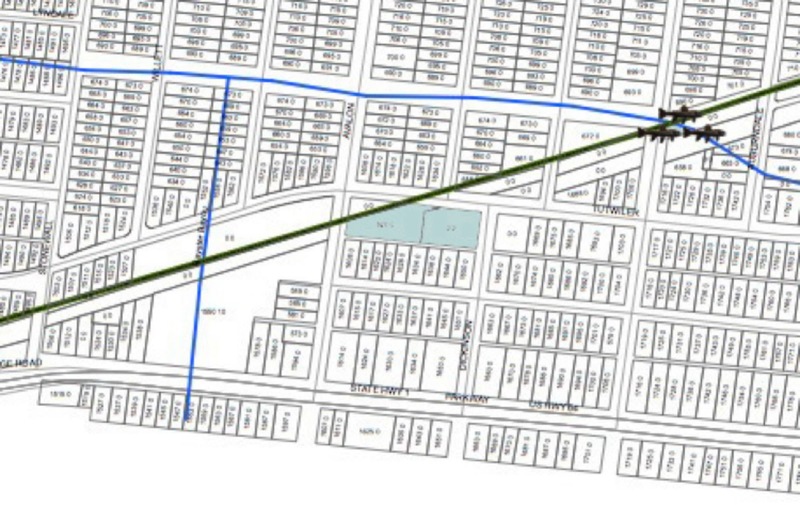 I propose placing the sculptures where Lick Creek intersects the Greenline near Evergreen due to its proximity to the creek, the Greenline and a well-traveled street. This will expose the sculptures to both vehicle and pedestrian traffic. 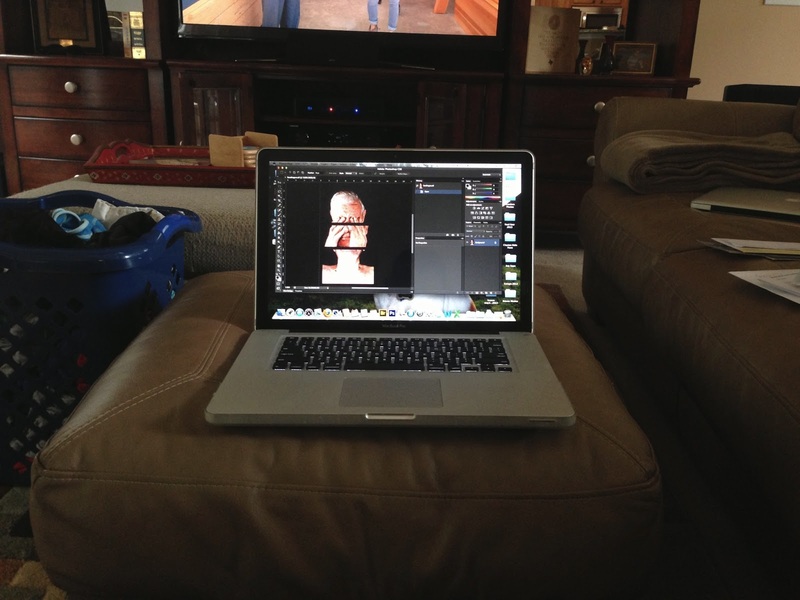 I am currently working up a project plan and timeline. Once Crosstown Arts and the V&E Greenline approves the plan, the project will begin. For updates on the project, visit Crosstown Arts website and Facebook page. To see more of Jeannie's work, visit her website.